Khieu Samphan (left) and Nuon Chea in the Trial Chamber of the Extraordinary Chambers in the Courts of Cambodia (ECCC). File photo. It is the first time that any of Pol Pot’s senior officials of the Communist Party of Kampuchea, as the ruling party was known, have been convicted of genocide, according to news reports. “The Secretary-General’s thoughts are with the victims of genocide, crimes against humanity and grave breaches of the 1949 Geneva Conventions,” the statement said, adding that Mr. Guterres also appreciated the dedication and hard work of everyone involved in the important work of the ECCC, and called on Member States to continue to provide support to the tribunal. He said it was also an historic verdict, when it comes to preventing similar crimes in the future: “While criminal accountability is foremost a tool to provide justice and redress to victims, it also has an important preventative function as a deterrent as well as to help societies in reconciliation efforts,” he said. 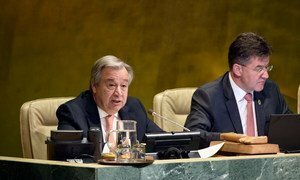 Atrocity crimes – genocide, crimes against humanity, war crimes, and ethnic cleansing – are not “inevitable”, the United Nations Secretary-General said on Monday, stressing that the international community must do more to end violence against innocent people. The United Nations-backed court set up to bring to trial those most responsible for crimes committed during Cambodia’s brutal Khmer Rouge regime today upheld life sentences for two top former Khmer Rouge leaders on Wednesday for crimes against humanity.